Creative Urethanes has carved out a specialty by producing urethane skateboard and longboard wheels, among other products for various industries. CRANSTON, R.I.—Mearthane Products Corp.'s third deal in the last 15 months also is its largest. The firm has acquired Creative Urethanes Inc., a custom molder of polyurethane elastomers. Details of the deal were not disclosed, but the addition expands MPC's urethane business by about 40 percent, according to Pete Kaczmarek, president and chief operating officer. MPC has known Creative, based in Winchester, Va., for more than 10 years, and there had been an effort several years ago before Kaczmarek came on board at MPC to make the acquisition happen. "But the timing wasn't right," he said. "MPC wasn't in a position to do a good integration, and everybody decided it wasn't the right thing at the time." When he joined MPC in 2016, Kaczmarek reached back out to Creative, and the process started again. After a pause of about a year, the timing looked more favorable to all parties involved, he said. Because of the due diligence done in the previous attempt, the teams were able to come together quickly and figure out what would benefit both companies. Aside from the additional urethane business, Creative also brings a new range of capabilities to MPC with a variety of processing techniques for cast urethanes, most notably reaction injection molding, Kaczmarek said. As MPC has expanded its marketing efforts, reaction injection has come up as an opportunity that the company has had to pass on until now. The process gives the enhanced properties of a thermoset urethane, but with the part complexity and ability to integrate components and other inserts seen in injection molding, he said. Urethane RIM can be used for enclosures, such as cases for medical devices. With Creative, the focus is more on elastomeric RIM, which has more abrasion-resistant yet soft and flexible components, such as flexible bumpers and padded handles. "It's good for things that would need to be soft and rubbery but also have tight tolerance, maybe fairly complex geometry, and also incorporate other components such as metal components," Kaczmarek said. Creative also brings the capability to make urethane pipe, which is primarily used in applications like waste treatment and mining facilities, Kaczmarek said. "Urethane is famous for being really abrasion-resistant, and so urethane pipe is used in some of those applications," he said. "This is a business that we think is a niche business, but we think it's a very significant business that is growing. We believe we can bring more exposure and more marketing and more business to it." Creative, which resides in a single 35,000-sq.-ft. facility in Winchester, has about 20 employees, all of whom will be transferring to MPC. The former owners, Richard and Thomas Heitfield, are retiring. The company was started by Richard's father Vernon in 1970, and the two have been running the business since Vernon's death. The company's former CEO, John Tiedemann, will stay on as manufacturing operations manager, Kaczmarek said. "He's very experienced. He's also got a background in urethane chemical sales, technical sales," Kaczmarek said. "He knows the materials inside and out, and of course he's very comfortable with the people and the processes." MPC plans to keep and grow Creative at its current location, Kaczmarek said. "There's some large equipment and expertise there that we just feel it wouldn't be a good idea to try to relocate," he said. One thing that Creative provides, even from its current location, is a new customer base. Even though both companies were in adjacent markets, Kaczmarek said there was no overlap in customers. "All of the sudden, we have a new group of customers that we can bring the technology that MPC specializes in, and we can bring the Creative capabilities to the MPC companies," he said. "That's a really important aspect of the strategic reasoning for the deal." Though they overlap a little bit in open casting, Creative tends to focus on larger parts than MPC's smaller machine parts. Creative works with the rail industry, producing wheel chocks and handles, and other parts to be used in switching yards. 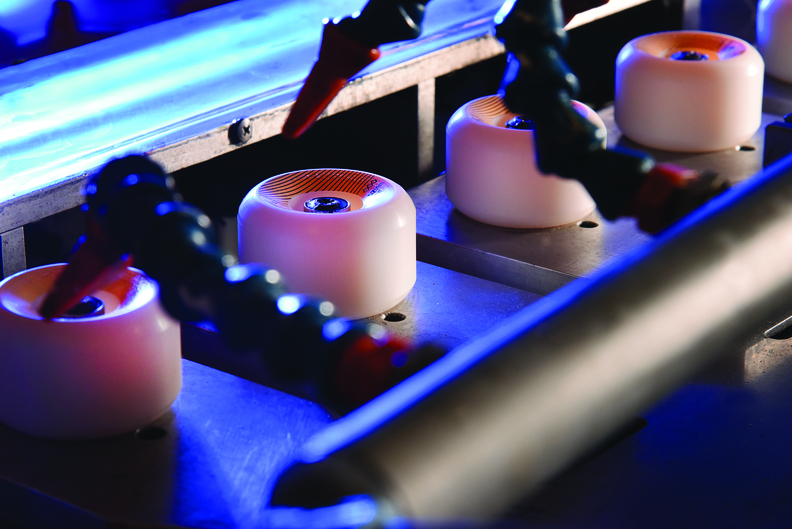 Another point of overlap goes back into MPC's history, as both MPC and Creative were pioneers in urethane skateboard wheels around the 1970s, Kaczmarek said. MPC eventually shifted toward inline racing wheels, a market it still serves today. But Creative continued providing specialty urethane skateboard and longboard wheels. "Now we can take those wheels and bring them into our channels as well," Kaczmarek said. "That's a piece of intersection that we think is really valuable." Creative is another piece in MPC's strategic plan for expansion, which Kaczmarek said includes trying to drive faster organic growth and growth through acquisitions and partnerships. Within the last two years, the core business at MPC has grown by about 20 percent organically, and the acquisition will boost that amount in the future. "The nice thing about Creative in particular is that we can see how we can augment our organic growth," he said. "It's not just tacking on some additional sales. It's adding capabilities that are going to grow us organically going forward too." MPC also has seen growth from a recovering economy, but Kaczmarek said the real driver has been how the company has improved its marketing and social media and digital efforts. Because MPC is such a small company, it doesn't really have an external sales force and relies on customers finding the company through media. "That has really been an effective way to get new opportunities into the fold," he said. "A pretty significant portion of that growth has just been finding new opportunities from people who didn't know about us and didn't know we could solve their problems." In May, MPC acquired Rhode Island Water Jet L.L.C., a provider of precision computer numerical control components and machining services based in Newport, R.I. The details of that acquisition were not disclosed. RIWJ, and the acquisition of Elmco Tool Inc. in 2017, shows the two paths that MPC is using for growth, Kaczmarek said. "One path is the main path to build up our core urethane molding and processing capabilities through acquisition," he said. "Then alongside it, and Elmco was the first step, is building up our precision metals machining capabilities." A lot of the lead time and cost structure that affects MPC's ability to service customers depends on metal tooling when it moves to production. 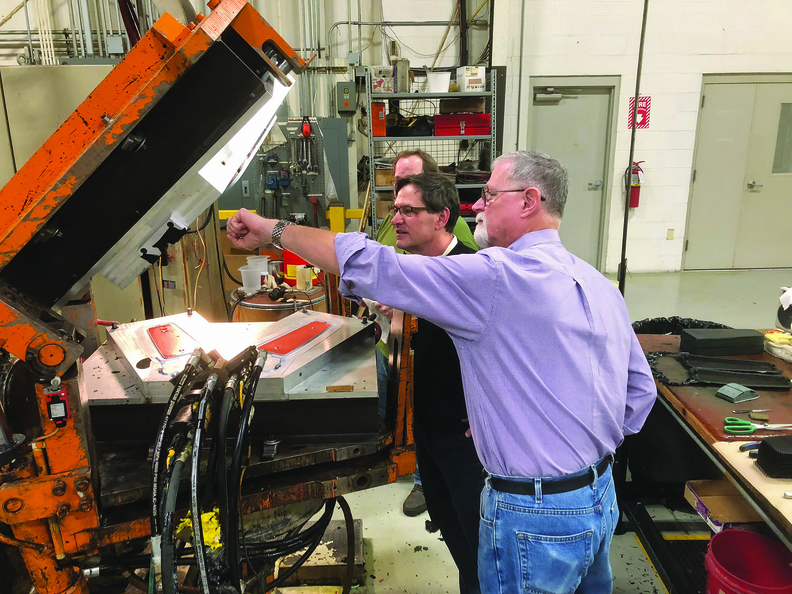 Kaczmarek said having the capability to produce that tooling in-house and having expertise available is a big help to that side of the business. The company also is seeing an increased local demand for short-run CNC metal machining capabilities, where a lot of the original capacity has retired. "Demand has increased, and it's not an industry people are starting up very often anymore," Kaczmarek said. RIWJ brought on a new capability of water jet cutting of metals and plastics, which allows the production of a finished part more economically, but also improves processes like tool design and prototyping in the urethane business, he said. The company, which employed three people, was able to be integrated into the Elmco facility in Bristol, R.I. Looking forward to more acquisitions, MPC continues to look for precision metal machining opportunities because it helps the urethane business, and allows the company to offer a broader range of services to customers. Kaczmarek said he believes demand will be growing in that space, and more acquisitions are likely on the way. "We see a lot of opportunities in front of us and we'd like to capitalize on them, and we have the wherewithal to do that," Kaczmarek said. "The thing you always want to do is make sure you're growing in a smart way and not overextending yourself either financially or managerially. We're cautious in that regard as well." MPC understands its capabilities and niche well, and is working on improving in those areas rather than jumping into wholly new territory, he said. There's no overall hard and fast target company size, but the company does have constraints as to whether a new acquisition makes sense or fits the larger business strategy. MPC is continuing to develop its management team to handle the company's growing footprint, alongside employees at the shop level. Kaczmarek said one interesting aspect of the custom components industry is that it crosses almost every end-use market, which affords MPC a broad level of diversity from precision parts for ATMs to inline skate wheels. While those markets are all strong now, that diversity gives MPC some resilience if one market sinks. One market that's literally meant to sink has seen an increase in business, as an MPC product line has seen some business pick up from the new construction of nuclear submarines, he said. The company's Durathane G polyurethane is used for some materials for submarine parts, which has seen an uptick in Rhode Island. The material also is seeing broader interest outside military applications, in components that need high tensile strength and high abrasion resistance. It can be used for applications such as gears in place of metal gears. Graphite is incorporated into the polymer, so it has almost a self-lubricating property, making it wear quietly often without any external lubrication. Kaczmarek said the company's close work alongside the State of Rhode Island has helped make its growth possible. The firm has received some help with training and recruitment programs in the past, and got assistance in training employees on a brand-new business information system. With the state's help, integration of the new system was done effectively with few glitches. The state also has been a driver of export trade missions to open domestic companies to international opportunities, he said. Kaczmarek has accompanied a trade mission to Ireland to look for new business and just returned from a mission to Scotland and England. "Our focus is to find industrial designers who we can educate about the versatility and capabilities of our technology, and that often leads to new opportunities for us," he said. Because the state is so small, it makes it easier to stay connected with civic leaders, Kaczmarek said. "It's really a matter of helping them understand how helping us helps them and the state," he said. "We've been able to cultivate a really good relationship with the (Rhode Island) Commerce Corp. and the local manufacturing extension program here that supports manufacturers."